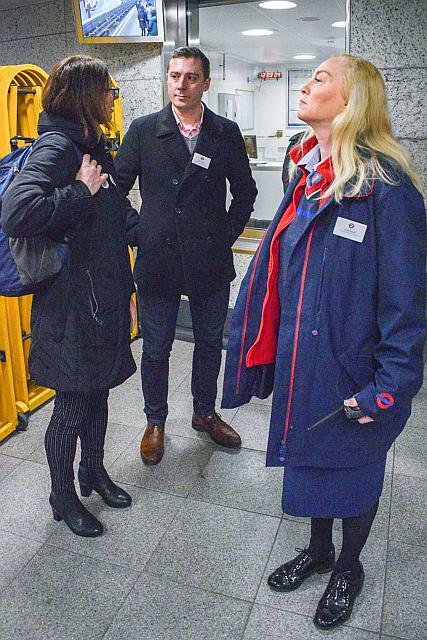 Saturday 26th January was the first day of TfL’s District Line 150th anniversary. This begins a programme of events throughout 2019 which involve talks, station tours, steam trains on the District through the Central London tunnels. The stations that participated in this day’s events were Westminster, St. James’s Park, Victoria, Sloane Square and South Kensington. Tweets on the day extolled the fact a tote bag was on offer and these were limited to just 25 for each station. 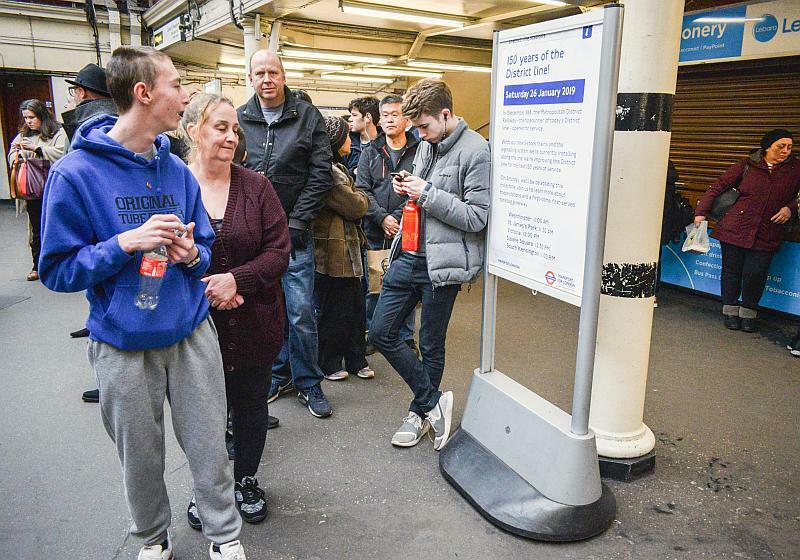 TfL say they will eventually cover the entire sixty stations on the line. Twenty five bags for each station works out at 1500 bags for the whole line! 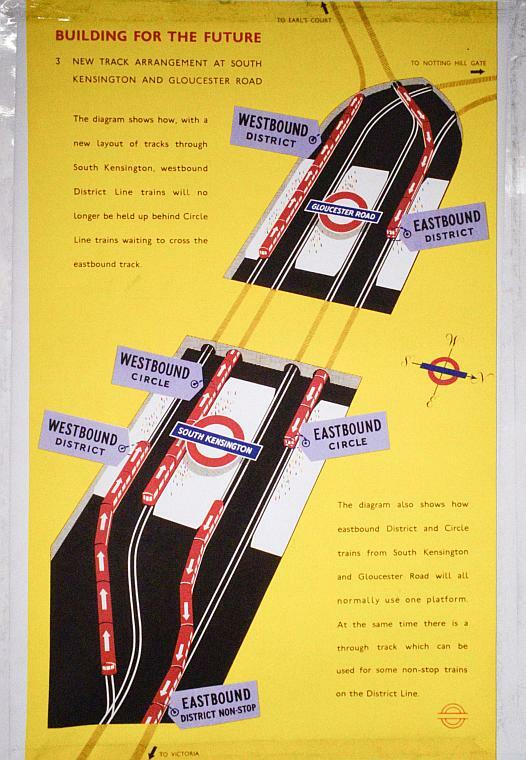 The District Line opened on 24th December 1868 and was originally known as the Metropolitan District Railway. Its stations were those covered in today’s event these being South Kensington to Westminster. Like all the other underground lines it invariably expanded greatly and it was actually a much bigger system in its heyday. 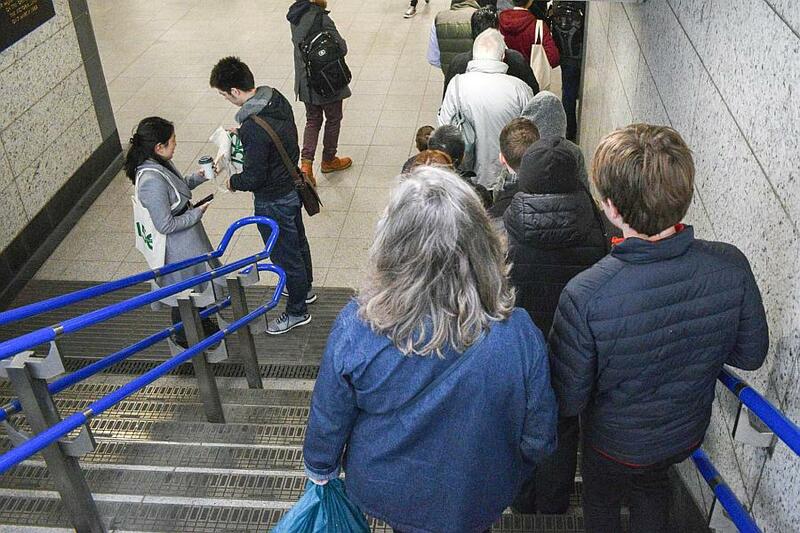 The queue at the Wilton Street entrance to Victoria tube station as we wait for our turn to be given a tote bag. No luck! 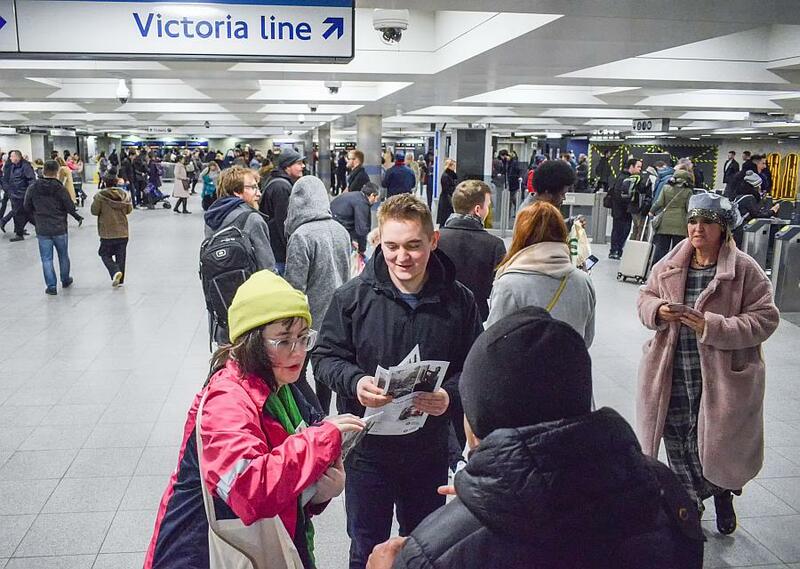 TfL’s Ann giving handouts covering the history of Victoria tube station. TfL staff present at the Victoria event. Dale Smith (centre) gave out the 25 tote bags allocated to the station, whilst Sue Lofthouse (left) gave out the tote bags at the other stations. We will see Dale again in a day or two on a yet unpublished post. I found the Victoria ‘District’ event a bit odd. 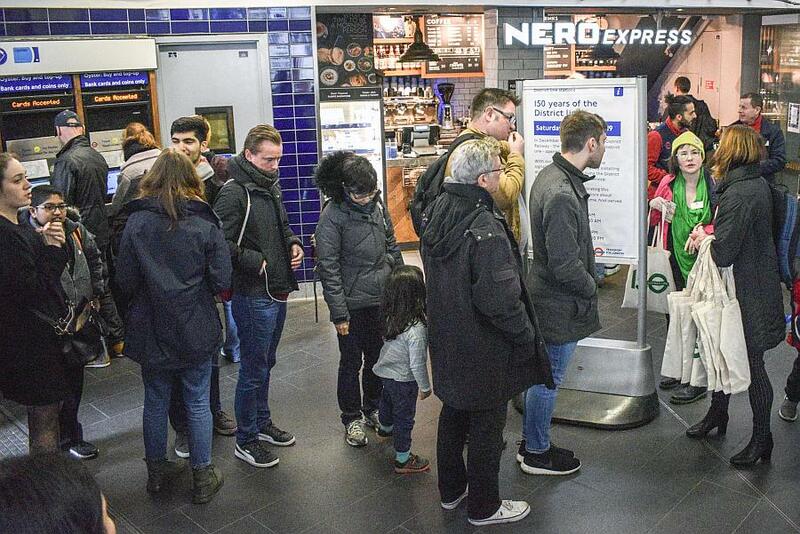 First it seemed more of a Victoria Line thingy, being held in its new ticket hall, and more so since Dale is the Victoria Line’s Head of Line Operations! Not only that, the Victoria handout (shown below) featured instead a Victoria Line poster. And it was a District Line anniversary! But we mustn’t argue on this point simply for the sake of brevity. 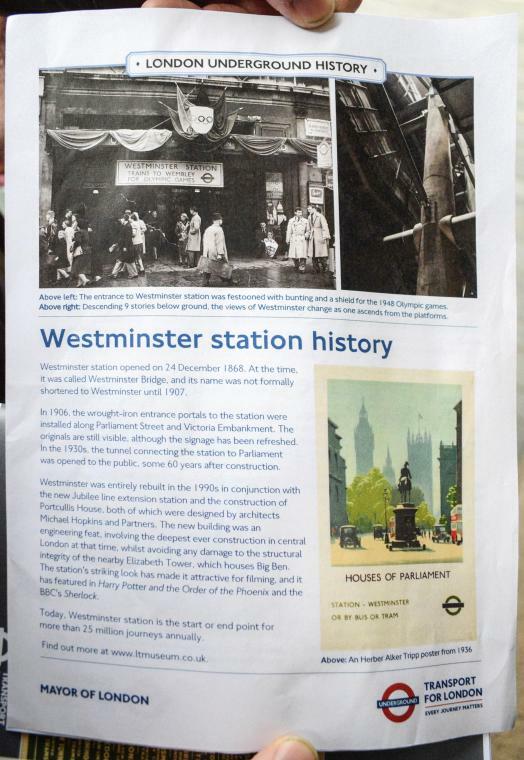 Westminster and Victoria were not really solid District 150th events since these stations didnt feature any posters seen at the other stations. 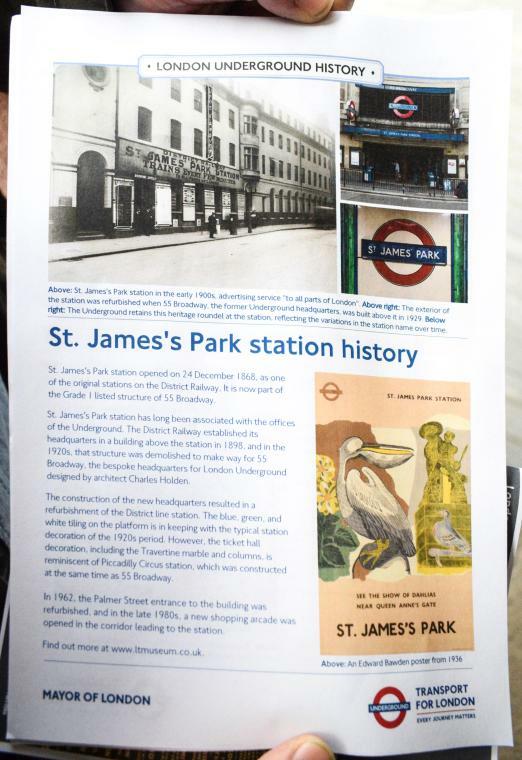 The other stations qualified more, St. James’ Park by way of its huge backlit posters above the stairs, whilst both Sloane Square and South Kensington had excellent display of posters covering the history of the District Line and many replica bygone District Line posters. All the stations participating had handouts detailing each station’s individual histories and these are depicted below. Despite my plans to take photographs of the event at South Kensington I wanted to not see someone there so I just did a few quick pictures and left. Thus I did not get to see that station’s handouts. Both the Westminster and St. James Park handouts I very kindly asked someone if I could photograph their copies which is how I got these pictures. All the handouts have the same basic information on the backpage which details a general history of the District Line. The Victoria and the Sloane Square handouts I was able to get my own copies and these are scanned for display here. 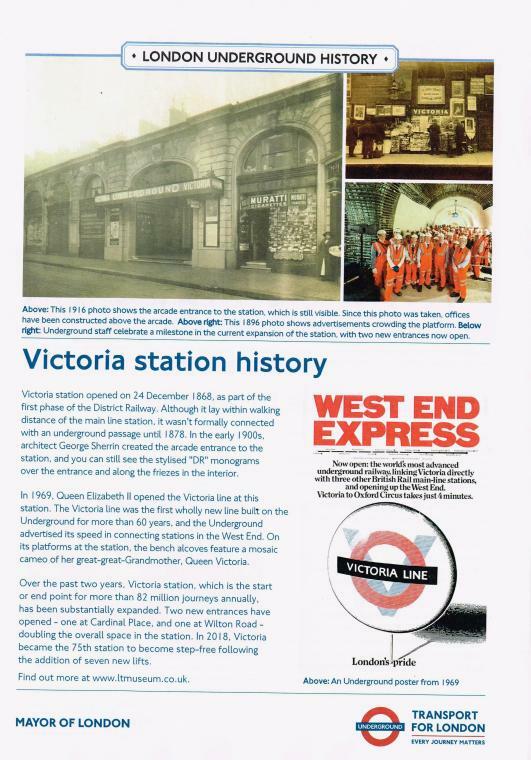 Note the Victoria Line poster which sits a little odd in the context of the District Line’s 150th anniversary…. 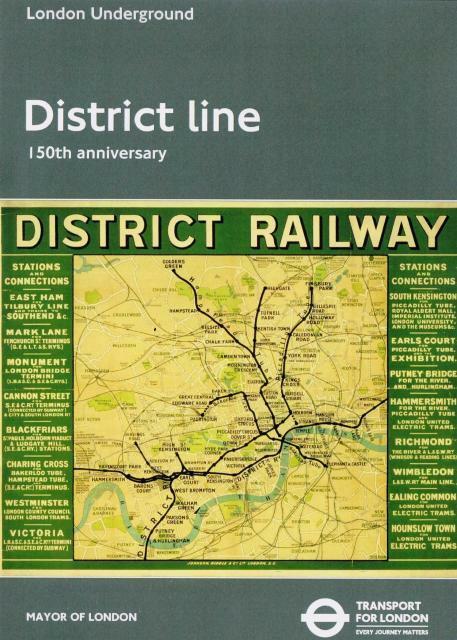 In much the same way as they did with the Victoria Line’s 50th, a special booklet on the line’s history was issued for the District Line’s 150th anniversary and the cover featured this map of the District’s early days in the 1900s. A little more history on the District Line… as well as Upminster at the eastern end of the line, the District’s western branches led to Hounslow West, Ealing Broadway, Rayners Lane, Richmond, Wimbledon, the Olympia and Latimer Road loop, the Hammersmith branch, High Street Kensington – Edgware Road, the entire north side of the Circle Line, and the East London Line. District Line services at one time used to run from Ealing/Richmond/Wimbledon via High Street Kensington, Baker Street, King’s Cross and Liverpool Street to Upminster! Even though the District Line has lost most of its northern sections and the Hounslow line, the Olympia and Edgware Road lines are still worked by District trains. Today one will still find two or three through trains from Ealing Common/Olympia to Edgware Road and Hammersmith to Upminster so the District’s old stamping ground is still worked in part by trains from Ealing, Upminster or Lille Bridge depots which take up duties on either the Hammersmith & City or Circle lines. The queue at Sloane Square for the District 150 handouts and tote bags! 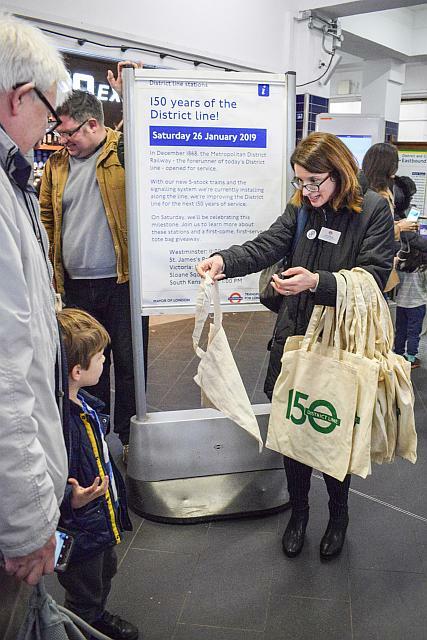 TfL’s Sue Lofthouse, Head of District Line Customer Services, gave out the twenty five tote bags allocated to Sloane Square station. This little guy was one of the first to get a tote bag at Sloane Square! Another proud owner of a District Line 150th tote bag! 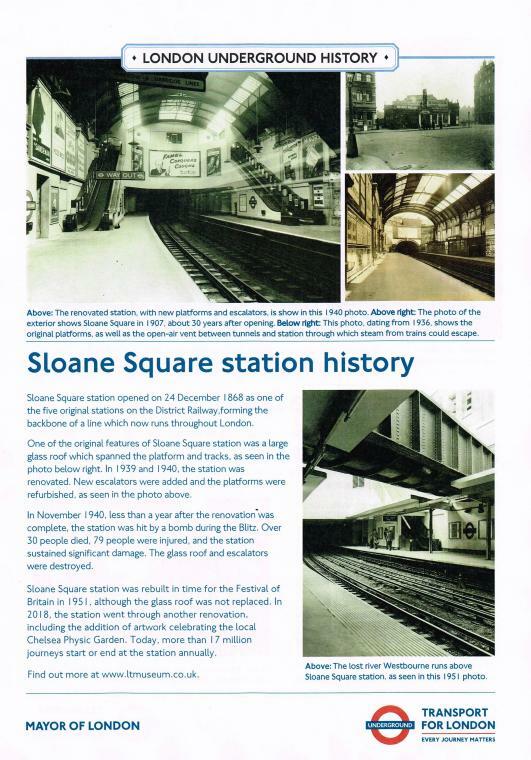 The station’s history handout for Sloane Square scanned from my copy. 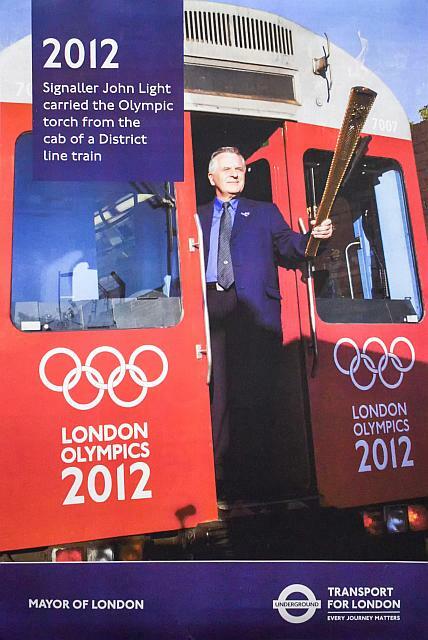 One of the special posters at Sloane Square showed the 2012 Olympic torch in the front cab of a D78 stock. 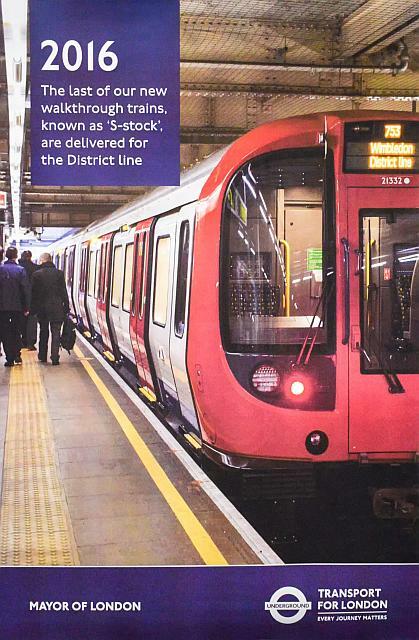 Another poster featured the very last S stock train to be delivered to the District Line. This is a great poster, I haven’t seen it before tbh! 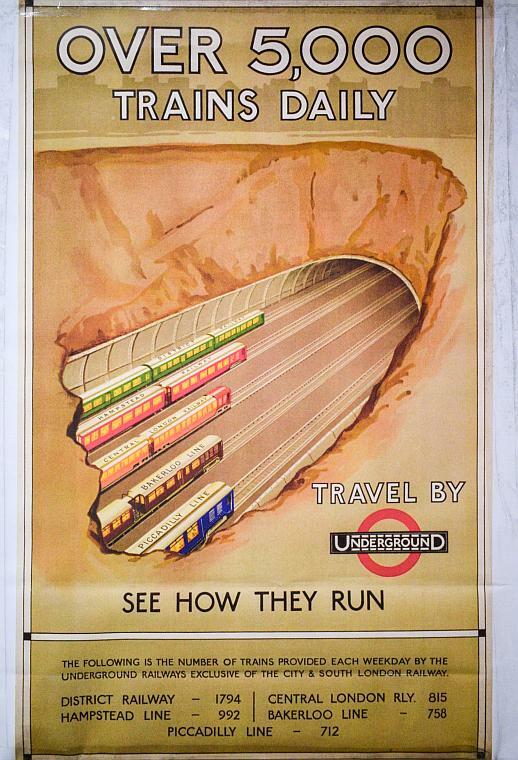 Its an interesting depiction of the five UndergrounD lines then in operation in London under the same umbrella organisation (Underground Electric Railways Company of London) and gives the daily number of trains running on each line. The tunnel is fantasy of course! Another I have not seen! Its also these days a bit of history as the four lines illustrated are no longer extant. Note the non-stop District train depicted. These changes depicted above are clearly for a period following the closure of the bay platform at South Kensington which would be 1957 or later. The new arrangement itself did not last long and the four track system was taken out of after just ten years use leaving the short section of double track to the west of South Kensington station which is still in use. Previous Post: Old tube station reveals itself! Your mention of the “Cavernous” Crossrail stations prompts me to air my own view that the budget for this line could have been reduced if they hadn’t opted for luxury cathedrals for stations, rather than utilitarian designs. Did Paddington really need all those optional extras that cost fortunes? The fancy glass ceiling with clouds, the luxury brick effect walls.. All the stations have very fancy cladding, and costly architectural add-ons. All very nice of course, but maybe we could have had XR2 as well, for the same money, instead of the deluxe CR1 on its own.